I am sure that most people who read this blog have their own secret crush about times gone by, whether it be kitchen appliances, cocktail bars, design or cars that purr. Some of you might even have stories to tell but what about the rest of us who can only fantasize about. Meet Joanne Massey, a 35-year old housewife from Stafford, England who have made her fantasy become reality. 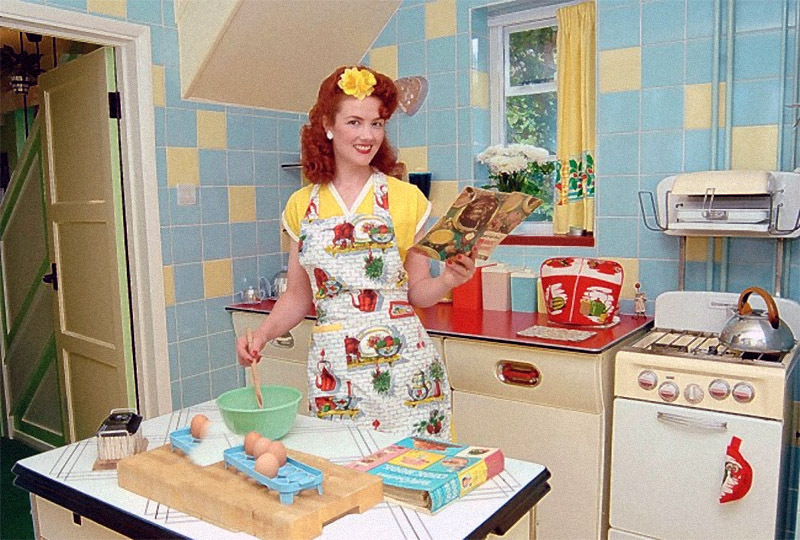 I love nothing better than fastening my pinny round my waist and baking a cake for Kevin in my 1950s kitchen. I put on some lovely Frank Sinatra music and am completely lost in my own little fantasy world… I admit I am in retreat from the 21st century. When I look at the reality of the world today, with all the violence, greed and materialism, I shudder. I don’t want to live in that world. Read the full story at The Daily Mail and meet two other women who has embraced the idea of living in the 1930s and 1940s.